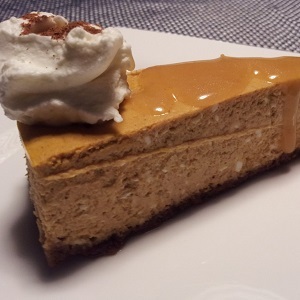 A great alternative to pumpkin pie made with gingersnap crust and Homemade Caramel Sauce! To make the crust combine gingersnaps and sugar in a food processer and mix until crumbs are fine. Cover with plastic wrap and refrigerate until chilled. Best if chilled at least 4 hours or even overnight. To serve, let the cheesecake stand at room temperature for about 30 minutes, then cut it into wedges. Serve with room temperature homemade caramel sauce drizzled over each piece of cheesecake and sweetened whipped cream if desired.